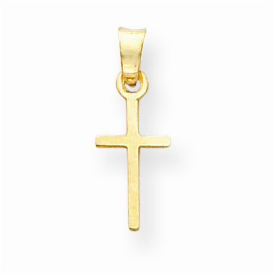 A truly stunning piece of jewelry, this polished cross charm is solid and set in 14 carat yellow gold. Measuring 17mm in length and 7mm in width, this yellow gold cross charm is the perfect accessory to show your love and faith this holiday season and everyday in between. We guarantee our 14K Gold Polished Cross Charm to be high quality, authentic jewelry, as described above.